Recently I was looking at a customers website and saw a blog article titled Influences - Part 1. by Karl Holtby. If you visit the link you can read Karl’s words about his admiration for Japanese style art and how he has aimed to recreate the artwork with his own camera. Considering a lot of Japanese art has a fantasy-like feel to it… he certainly does a great job with it (his ‘Gone Fishing’ image is excellent). It reminded me of my own fondness for Japanese art and the slow lessons I have learned over my years. I grew up in Canada, my mothers side of the family is Japanese, so we had a fairly strong but subtle Japanese influence growing up. Not only with my own socialization but also things like art, cuisine and language were passively present throughout my life. There was a style of art that I always loved - it mostly showed Japanese mountains with a diffused gradient haze defining ridge-lines. It creates a certain soft-light look that I love and lingers over much of Asia. One day in Japan, after climbing and camping on the countries second highest peak; Kita-Dake, we were treated to arguably one of the best views of Mount Fuji. This view is known for presenting the hazy ridge-lines I was speaking of above. The only thing is at this point in my life I had not acknowledged a connection to the art and the real-world haze. I assumed it was just an embellished style of Japanese painting. The next morning at camp we shot images of the sunrise. It was spectacular but it wasn’t what I expected and I somehow felt disappointed because there was no haze separating the ridges that would help frame Mount Fuji. As we packed up our camp, an older man walked down to our site, he saw us shooting in the early hours and let us know that what we had witnessed while the sun rose - was a rarity. 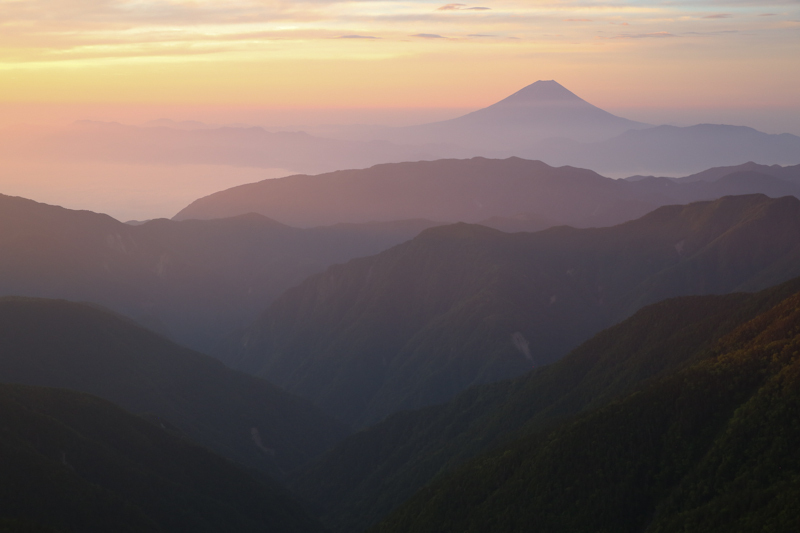 And that if one is lucky, once a summer - the morning haze will not cushion the ridges and you will see a crisp view of the valley wandering towards Mount Fuji. After 10 plus hours of hauling in camera gear and a tent up Japan’s 2nd tallest mountain (and hoping for the haze), I was unsure how I felt about the ‘rarity’ I had just experienced. Although, within a few moments, I connected the diffused and hazy paintings to the rare haze-less mountains in front of me. The paintings I had seen in the past, were accurately crafted representations of what the artist’s saw. There was no enhanced fantasy-like feel needed, it was in fact a beautiful Japanese reality.